A loan of $125 helped to purchase a solar lamp. Mercy works hard, to support five children. She is married, and she has a general store business in the Philippines. 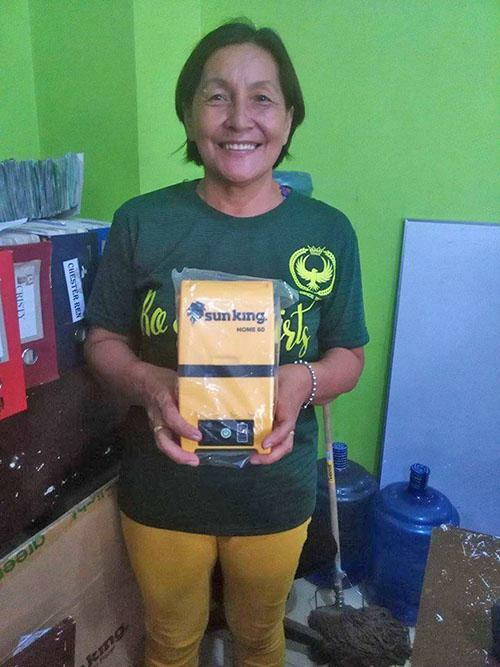 Mercy requested a PHP 6100 loan through NWTF, to buy a solar lamp. She is getting the solar lamp, because she wants to be able to extend her business hours, and do business even after nightfall. She is aware that by using the solar lamp, she will be not only saving money, but also helping the environment and reducing health risks to her family. It helps clients who faced natural disasters recover with green products. This loan is part of NWTF's green loan program, which helps clients gain access to environmentally friendly products that reduce pollution in the Philippines.